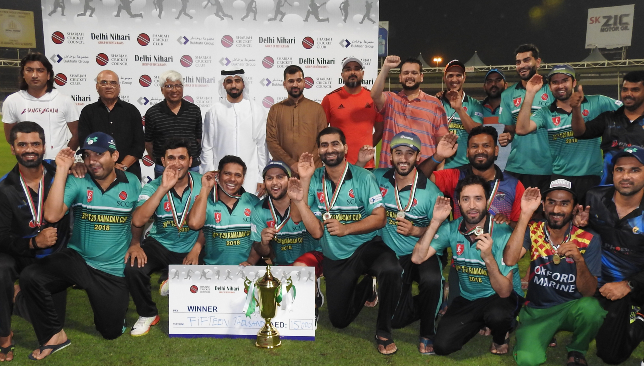 A man of the match performance from Tahir Lateef who bowled a great spell ensured Phoenix Medicines clinched the 30th Sharjah Ramadan Cup 2018 at the Sharjah Cricket Stadium. Batting first, Noor Al Yemen achieved 158 for seven in 20 overs thanks to a late knock from Waheed Ahmed who slammed a 33-ball 60 not out including three boundaries and five sixes. Tariq Mehmood chipped in with an unbeaten 19 as Noor Al Yemen achieved 158 for seven in 20 overs. Ansar Khan had given a quick start with a 14-ball 25 supported by a four and three sixes. Tahir Lateef bowled a deadly spell with a four wicket haul in his four overs giving away 15 runs. Chasing a tricky target, Phoenix Medicines lost a wicket early but Rohan Mustafa made a quick 21 while Muhammad Waseem fired a 24-ball 41 supported by four boundaries and a six to put their team on track. Muhammad Ikram Jura (23, 27b, 1×4) and Shoaib Laghari (32, 22b, 3×4, 2×6) made great contributions as Phoenix Medicines achieved the target in the penultimate over. 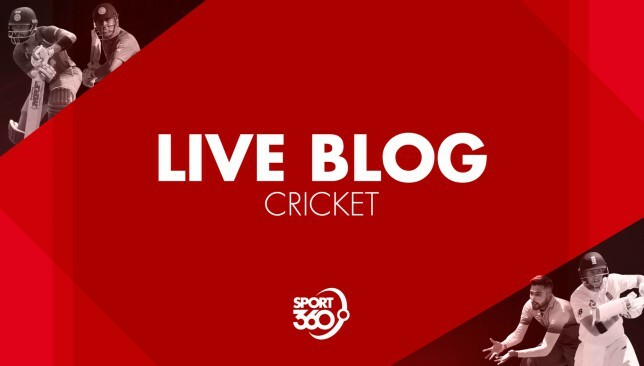 Ashish Peter and the rest of the Sport360 team are in place to provide you with the latest news, comment and analysis on all things cricket. Our daily blog will ensure you have all the latest updates throughout the week but we want you to get involved, too. It was that man again Rashid Khan as the 19-year-old stole the show – taking four wickets in Afghanistan’s six-wicket victory against Bangladesh. Read more from the second encounter here. Rohan Mustafa will be counting the former Australia captain Steve Smith as one of his team-mates after being selected to play for Toronto Nationals in the upcoming Global T20 Canada tournament. 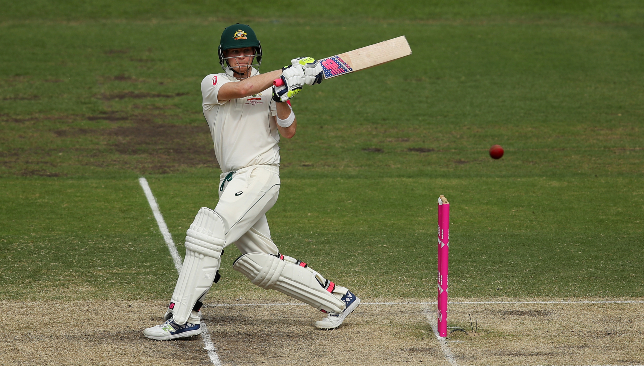 Smith is currently serving a 12-month ban from State and international cricket following his part in the ball-tampering scandal. But Mustafa highly regards the World Cup winner. Read Denzil Pinto’s story here. Nottinghamshire seamer Jake Ball has been given an England recall following an injury to all-rounder Chris Woakes. Woakes will miss the one-off ODI against Scotland and the initial part of the five-match series against Australia. Read more about this developing England story here. Pakistan’s Test engagements in Ireland and England came to a conclusion last week. Sport360’s Waseem Ahmed has reviewed the performance of four youngsters in the Pakistan Test squad including Shadab Khan and Faheem Ashraf. Click here to see how the four young guns performed in the three Tests against Ireland and England. Pakistan head coach Mickey Arthur was not a happy man following his side’s defeat by a margin of more than an innings in the second Test against England. Arthur has promised to dish out a ‘couple of hidings’ to his young Pakistan squad. Read more about the Pakistan coach’s strong comments here. The Pakistan duo of Azhar Ali and Asad Shafiq are reportedly in line for county deals with Surrey and Somerset respectively. Azhar could reportedly replace India skipper Virat Kohli at Surrey. Read more about this developing story here. Less than 10 days remain for Afghanistan’s maiden Test after obtaining full ICC membership last year. 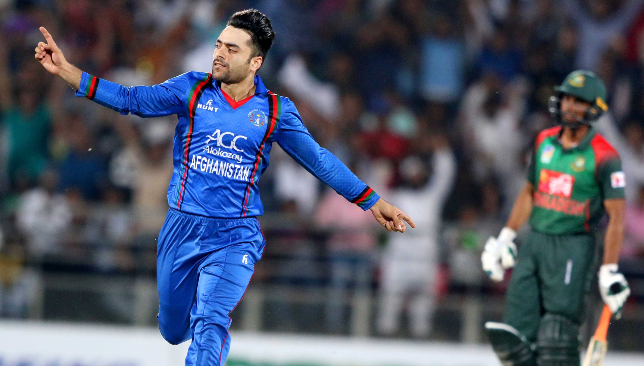 The Afghans will take on hosts India at Bengaluru on June 14 and leg-spinner Rashid Khan cannot wait to make the transition to red-ball cricket. Find about what the Afghan teenager said about his expectations for the Test here. Virat Kohli’s previous struggles in England will not be forgotten anytime soon with India slated to tour the country this July. According to Australia legend Glenn McGrath, the Indian skipper will have his work cut out against James Anderson if he fails to adapt early. Read more about what the former Aussie pacer had to say about India’s chances in England here. Ahmed Raza admits he was little bit surprised to have been picked but cannot wait to play alongside Shahid Afridi and Chris Lynn at the Global T20 Canada. Raza was drafted in as Edmonton Royals’ 11th pick alongside UAE international team-mate Shaiman Anwar. Both will be sharing the same dressing room as ex-Pakistan skipper Afridi and blistering T20 batsman Lynn in the inaugural competition which begins June 28. 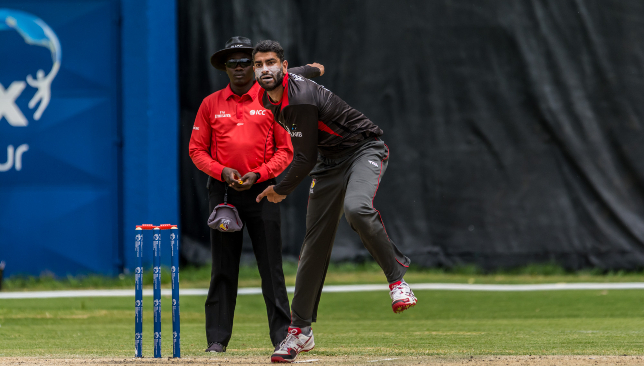 For Raza, it will be his first franchise-based T20 tournament and the spinner insists it’s a great feeling that his talents have been recognised after taking 25 wickets in 37 T20 matches for the UAE. “Finally being picked in the inaugural edition is a very good feeling and I’m hoping to do well there,” said the 29-year-old. Afridi and Lynn are among the high-profile names in Edmonton Royals’ squad, which also features ex-New Zealand batsman Luke Ronchi. While Raza is looking forward to rubbing shoulders with the elite stars, he says it’s an honour to count Afridi as one of his team-mates. “Chris Lynn is a very big name in T20 cricket and Shahid Afridi comes with the whole stardom thing. He really enjoys playing in front of big crowds and he’s one guy who will pull the crowd together and that will be something I will be looking forward to. “He is a very attacking cricketer and would never let the game go. His aggressiveness was there and still to date, is playing cricket his own way. He has been around for two decades and has a lot of experience.